cottage on authentic hamlet. Nice terrace, swimming pool, lots of privacy. Property 15: cottage on authentic hamlet. Nice terrace, swimming pool, lots of privacy. 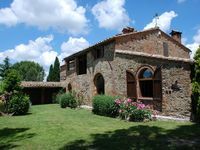 Florence, Siena, Arezzo: Modern comfort and style in a historic Tuscan cottage. Property 17: Florence, Siena, Arezzo: Modern comfort and style in a historic Tuscan cottage. We loved the beautiful views and setting in between two wineries! One minor issue was that there was no oven although it was listed as an amenity. We made it work, as we were not cooking that much&hellip; and Bought foods we could on top of the range. We would definitely stay here again, everyone was Extremely accommodating during our stay!